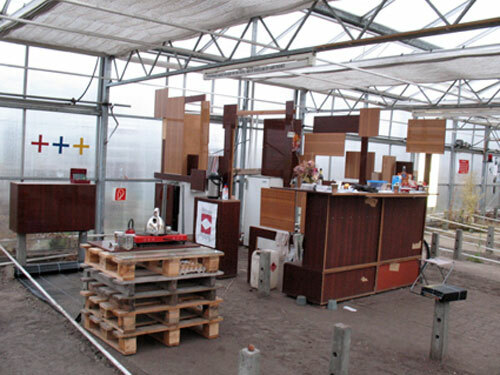 Sound piece produced for the exhibition poliflur 0101 in an abandoned greenhouse. There were wild growing tobacco plant – remainders of expired EU-subsidies for cultivating tobacco. Machorka is a negative term which is no longer used for (Russian) Tobacco. 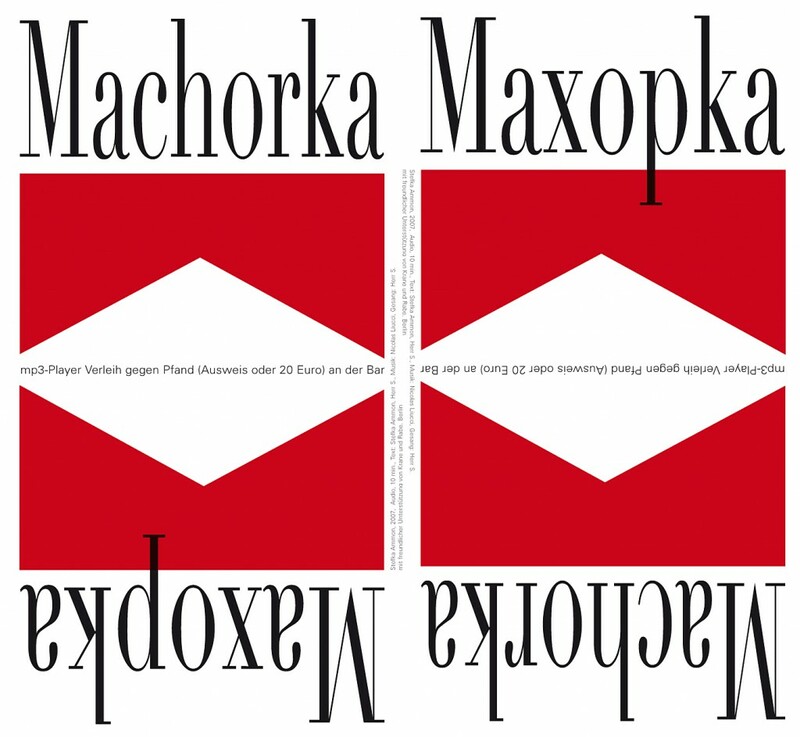 Machorka, 2007, poster with info on MP3-player, audio-play, 6 min. The greenhouse had once been used for growing tobacco. Tobacco plants were growing wild all over the grounds and inside the greenhouse itself. My grandfather always smoked, and I was reminded of the word machorka, which in our family referred to bad, stinky tobacco, the kind people grew illegally after the war in Poland and in Germany, in allotment gardens and along railroad embankments. When I began to research the origins of the word machorka (a Russian tobacco strain derived from the wild species Nicotiana rustica), I was amazed that no one I knew was familiar with the term. Then I came across the website of Dieter Schönefeld, who had posted a collection of songs there including one called “Machorka.” Schönefeld told me a very moving story from the Cold War era. I included it in an audio piece, along with Schönefeld’s singing and music by Nicolas Liucci-Goutnikov. Schönefeld himself had studied information technology in Dresden from 1963 to 1969. He and a few of his school friends had internships in East Berlin during the fall semester of 1967–68. At this time they got to know a couple of students from the Freie Universität in West Berlin, with whom they had a number of “slightly covert” meetings. During this period they changed the lyrics of “Machorka,” which was well known in Dresden at that time, to the current version. In the original version of the song, which Schönefeld and I referred to in our correspondence as “the Dresden version,” the refrain goes: “Machorka, machorka, give it to us, without it we just can’t keep up.” The song describes conditions of such scarcity that a dog is roasted on a spit, and it mentions brother countries such as Poland, Slovakia and Uruguay, where the cry for machorka is also supposedly heard, again because of general hardship and the lack of better tobacco. And so we smoke machorka, this godforsaken plant. Refrain: Machorka, machorka, give it to us, without it we just can’t keep up. We always smoke machorka because it’s so divine. We build a wild campfire to roast a dog we found. However, thanks to the 1968 student protests, the Russian invasion of Prague and a fellow student’s failed attempt to escape to the West, Schönefeld and his group sang together only rarely. And later, after a student they knew produced a report on the youth of East Germany for SFB (a West Berlin radio station), it became dangerous for them to have any contact with West Berlin. But Schönefeld and his friends continued to write to two of the West Berliners, and so the Stasi got involved. Thus harmless citizens gradually became “enemies of the state”: In February 1984 their East German citizenship was “revoked,” and Schönefeld and his family were deported to the West. Since reunification, says Schönefeld, he and his fellow alumni from Dresden take great pleasure in singing the old songs again whenever they get together. In those days, said Schönefeld in response to my further inquiries, many cabaret acts, plays and movies attempted to view and portray the GDR in a critical light. Even the most rigid party members hoped this might be a way to “improve” the construct of the state. The icy mood of the early 50s gave way to a more obstreperous tone after Khrushchev, leading to louder protests in the 60s and 70s, especially after the CSCE talks (cf. the expulsion of Wolf Biermann and its consequences). But during the Stalin era, no one would have dared make a peep (or a song); even loyal communists were being pulled off the street in those days. I realize that I still have almost no idea what it really meant for this country to be divided.